The prevailing economic model for human society is based on the expectation of growth. The media headlines show success measured by indicators such as the expansion in market share, in profits or in Gross Domestic Product. At the same time the indicators of the ill-health of our planet have for decades signalled the existence of physical limits to how many resources we can extract and how much pollution we can release. The headlines of how we threaten the sustainability of our own civilization increasingly stare us in the face. In the argument between growth on the one hand and sustainability-oriented development models on the other, the nature of the human soul and its search for prosperity beyond material luxury consumption is easily lost. 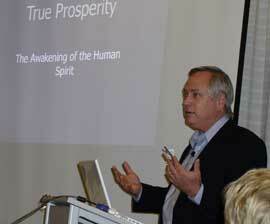 This conference put that soul at the heart of the discussion of how we define, measure and achieve true prosperity. CEOs, entrepreneurs, environmentalists, scientists and citizens learned from each other, while keynoters and panellists provided food for thought and offered a new way forward towards the broader vision of "enhancing the well-being and prosperity of humankind". Speakers and participants shared their own active role in bringing about new sustainable solutions challenging the current status. The keynotes were balanced with consultation and workshops dedicated to addressing participants own issues, questions and ideas, to bridge the gap between world views and what happens on Monday morning at work. Over 160 participants gathered in the de Poort Conference Centre in a rural Dutch woodland setting, while 39 others from around the world took part through the e-conference, receiving reports of the sessions and access to video clips of the main presentations. Thursday evening there were general introductions and interviews with some presenters so that everyone would know each other and their interests and be able to network more easily. Friday morning the conference was officially opened by Wendi Momen, chair of the board of the European Baha'i Business Forum, and Victoria Thoresen, board member of the International Environment Forum. Dr. Sylvia Karlsson, senior researcher at the Finland Futures Research Center and General Secretary of the International Environment Forum, gave the opening keynote on "What is the problem? Getting the facts right!" asking if there is a conflict between growth and sustainability. Sustainability must include not only environmental sustainability of the whole earth system including the human species, but also society and its economic and social organization. Sustainability must include the temporal dimension, where the policy horizon must integrate the long time lags in environmental systems with the medium time lags in social systems and the short-term perspective of economic systems. The spatial dimension is also important because human activities can have hidden impacts elsewhere, or be exported. Sustainability can also vary in quality between weak and strong. There is clear evidence today that unhealthy changes are destroying the life support systems of the planet, with an unprecedented rate of global environmental change for which there is no analogous state in the last half million years. Sixty percent of the planet's ecosystem services have now been degraded, leading to the conclusion that growth and sustainability are indeed in conflict. However they do not need to be in conflict if we redefine growth itself. We must change the economic accounting system that values the present more than the future. Can we live as if there was no tomorrow? Adulthood or parenthood means thinking about the next generation. Our love for humanity should be expressed in space and in time, considering the demands of all the human family, particularly those in poverty. Growth should be redefined to include those things that lead to the honour and exaltation of man, those virtues and attributes for which there is no limit. The following panel expanded on the concept of sustainability from three different angles. Dr. Rebecca Teclemariam-Mesbah of Bosnia and Herzegovina (Entrepreneur - PhD in Neurobiology, MA in Gender studies) described the social challenge of achieving local and global sustainability through gender balance, using biological analogies to show the importance of mutualism. 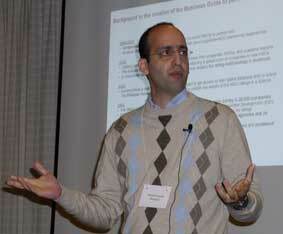 Shervin Setareh of Denmark provided a business guide to partnering with non-governmental organizations (NGOs). This can contribute to corporate social responsibility (CSR), accountability and communications, and improve employee morale. Partnerships can be for philanthropy, advocacy and awareness, or contribute to the core business. Since there is often distrust between businesses and NGOs, partnerships need to be carefully planned and monitored. But in a world with such complex problems and challenges of governance, partnerships are necessary among all sectors of society. Yves Garenne of France discussed the challenges of measuring sustainability, or more often unsustainability, particularly in the corporate context. Businesses undertake such reporting because it is a shareholder requirement, reflects the chairman's commitment, supports stakeholder dialogue, or most often for "greenwashing" public relations. While some standards for reporting are available, there are few reliable indicators, and difficulties of determining boundries with respect to the supply chain. Such reports are a sign that a company has decided to be part of the solution rather than the problem. Prosperity is the goal of human life. What definition of prosperity can we all agree to? Given the complexity of our goals, how do we get the agreement of all humanity and governments on how to address our problems? How do we reconcile the self-interest in business, economics and rationality with sacrifice and selflessness? How and where do we redefine the meaning of growth? Is ecological calamity the providence that unites the human race? What can we do now? Are we whistling in the dark? How do we deal with failure and chaos? What first three things do we recommend to world leaders, or do as individuals, to solve the crisis? How do we put a value on consumer demand for socially responsible and sustainable products? Instead of sliding into powerlessness, guilt and fright, how do we change our language and mindset to empower others? The world has enough resources but is unable to share them equitably. How and what do we share more meaningfully? When local people feel powerless before global problems, how do we empower them? A projects room was also established where people could post descriptions of social, economic or sustainability projects on which they would like to consult, seek advice or find support. 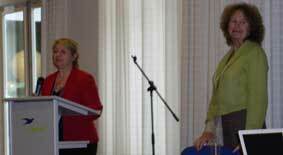 In the afternoon, two speakers presented their points of view on sustainability. Stephen Karnik, Chief Operating Officer of the Baha'i International Community (BIC) United Nations Office in New York, provided a human perspective on true prosperity as the awakening of the human spirit. At a conceptual level, human nature is fundamentally spiritual, and the material world is a reflection of our spiritual condition. True civilization is based on fundamental values, with our social world governed by moral principles, taking a long systemic view. Material solutions alone fail to address moral and spiritual development, requiring radical change. True prosperity is the presence or abundance of those ethical, moral and material resources necessary to achieve this ever-advancing civilization. This begins with the individual opportunities to acquire moral, intellectual and social capacities. We need spiritually-based indicators to guide us in this direction, such as those suggested in the BIC paper "Valuing Spirituality in Development". John Patterson of Canada then provided a business perspective drawing on his experience as a Christian missionary in India who then built a major information technology company. Beliefs, purpose and values can find expression in a business culture both through visible action and hidden roots. It is important to state the core company values based on common beliefs, and to define the behaviours that are desired or not desired, creating an operational model and establishing sustaining practices through rehearsal, reinforcement and review. Even a global organization can foster the human spirit and create a workplace community for the full realization of individual potential, balancing freedom and responsibility. His company has a retention rate of 92-95% which is unusual in the IT industry. The afternoon concluded with an outdoor activity to "walk the talk", where teams of participants walked through the forest and tried to find the answers to a series of questions on environmental and sustainability topics posted along the way. 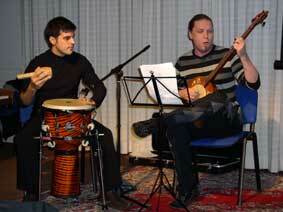 In the evening, a series of project presentations on the application of EBBF's core values was followed by a gala concert featuring renown pianist Nancy Lee Harper from Portugal, followed by music from Finland and the Altai Mountains of central Asia performed by Janne Lemettinen and Aram Aflatuni. Saturday's programme was devoted to offering solutions and new approaches to sustainable behaviours. Dr. Arthur Dahl of Switzerland, President of the International Environment Forum and a retired Deputy Assistant Executive Director of the United Nations Environment Programme, gave the Introducing Solutions keynote on ways forward to reach true prosperity (download powerpoint). After reminding us that business as usual risked causing the collapse of civilization as environmental degradation reached planetary limits this century, he explored the design criteria necessary to make the transition to sustainability. The growth paradigm was based on continuing population growth, the energy subsidy from fossil fuels, and the exploration of the planet for new resources, all of which are expected to end by mid-century. An alternative paradigm based on balance and moderation in material civilization, renewable energy sources, closed materials cycles and technological innovation would provide the means for more ethical and spiritual development of the limitless potentialities latent in human consciousness, with individuals motivated by service and virtue rather than wealth and riches. The planet would finally become unified in a world commonwealth, with institutions of governance able to harmonize the needs of all peoples, to coordinate its markets, and to distribute its products equitably. Sustainability required addressing the ethical challenge of evolving from egotism to altruism, and from "me first" to "all together". A transformation in human values or spiritual principles would allow society to evolve naturally in this new direction. Sustainable environmental management must be seen as a fundamental responsibility and prerequisite for both physical survival and spiritual development. Justice and equity, cooperation and trust will become the founding principles of social organization. New economic models will be strongly altruistic and cooperative in nature, provide meaningful employment and help to eradicate poverty. The process of change is accelerating, and we can either voluntarily work for this transition in a new spirit of entrepreneurship, or wait for catastrophe to force it upon us. What is encouraging is that climate change and the other challenges of sustainability are pushing nations to work together in their collective interest. 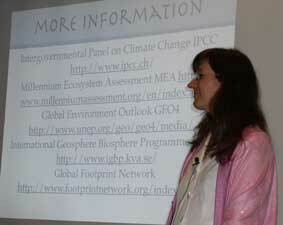 After the keynote, three shorter presentations looked at practical paths to a sustainable world. 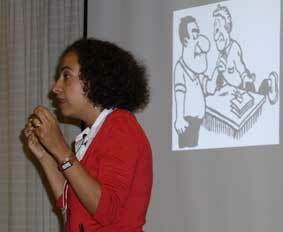 Tannaz Grant of the United States provided the perspective of an individual as a change agent. One individual avenue for action is as a consumer resisting the waste of the consumer culture. There are also professional avenues like urban planner, researcher, sustainable agriculture, and triple bottom line accounting. There is a place for moral educators teaching how to make decisions based on values with a focus on children. Finally moral leaders set an example for others. Individual transformation means winning the battle over one's self. 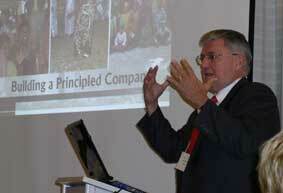 Doug Henk of Israel provided a business perspective, where sustainability means balance. While a business must make a profit to be sustainable, sound business management also means balancing the needs of all stakeholders. Gordon Naylor, Executive Director of the Nancy Campbell Collegiate Institute in Canada, explored the community perspective and the need for social justice. The present crisis is about our fundamental oneness, and the environment is telling us this. Social and economic development should involve the creative interaction between the practical and the spiritual, and we are trying to learn how to do this. The spiritual is that which gives meaning to life, and today spiritual poverty is greater than material poverty. We must integrate the four ways of knowing: science, reason, arts and religious truth, in order to know what it is to be human. Our vision must be world embracing. A first set of workshops allowed the participants to explore issues in smaller groups. Arthur Dahl introduced the European project on value based indicators of sustainability in which EBBF is a partner to develop indicators for companies. 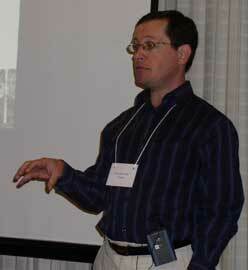 Steve Hall (USA) led a discussion of "green projects" in the construction industry. Gordon Naylor's workshop was on implementing a moral and ethical framework in your business, and Rebecca Mesbah's explored gender balance at work, harnessing the opportunities of feminine wisdom in business, the current situation in the workplace and the issues that are preventing this from happening. Diana Cartwright considered growth and profits in a world of extremes: what's a company to do? After lunch, a second set of workshops covered another wide range of issues. Alain Gauthier led a discussion on the topic: developing generative change leaders across sectors: an exploration of integral approaches. 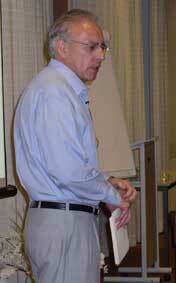 Lawrence Staudt shared his expertise on renewable energy and energy sustainability. Jean-Pierre Méan shared experiences, case studies and approaches to bring about sustainability by using new approaches fighting corruption. Aram Aflatuni showed how the media are a powerful means to influence and spread values. Mirjami Malleus and Janne Lemettinen asked: What do we really want? in a workshop where the participants had an opportunity to stop for a moment to check their lives and careers to see if they were following their values. Victoria Thoresen drew on her long experience leading a European network on sustainable consumption to explore informing and creating awareness of each person's role in creating sustainability through a responsible consumption pattern. The afternoon ended with the annual general meetings of the European Baha'i Business Forum and the International Environment Forum (see separate report). The evening programme started with a "world talk" roundtable of several of the conference speakers brilliantly moderated by Wendi Momen of England, in which she asked probing questions as she drew additional participants from the audience. Finally Augusto Lopez Claros of Spain, former Chief Economist at the World Economic Forum, offered a keynote on "The future world economy: the shape of things to come". Optimistically, we are better off than in the middle of the cold war, with a dramatic reduction in poverty in the last 20 years and 65% of the population in high income or high growth countries, compared with 20% in 1978. Science and technology have brought us closer and made it harder for demagogues to dehumanize the enemy. Public health has improved and science has the capacity to tackle all the challenges. We know enough about the right policies and institutions to see some countries become successful. On the pessimistic side, 58 countries with the bottom billion people are falling apart and diverging from the rest, led too often by psychopaths, crooks and those who take pride in their ignorance, and creating a global security problem. Those countries with the curse of valuable natural resources see them funding graft and corruption. We are still on an unsustainable path with carbon dioxide emissions accelerating from rising energy demand. The demonstration effect of the media makes people aspire to the American lifestyle, but there are supply constraints including water and food shortages. How do we reconcile the legitimate aspirations of the poor with an economic system under stress whose benefits cannot continue? Civil society must pressure governments to change public spending to restore the environment and its resources. Technology and innovation will be part of the solution. We must create good and services in a sustainable way with greater efficiency. How do we get there? One scenario is to consider the world like a building about to collapse, and to start building a new one elsewhere, but this means the needless destruction of things that are working well like the rule of law and property rights. A better scenario is to build on the things that work in constructive evolution through reform. This will require patience, solidarity and compassion as we find better ways of doing things. There is a trend toward global governance, which should provide an institutional and regulatory framework for fully integrated financial markets. Presently we lack enlightened leadership, and have inappropriate measures of economic growth. Yet 13 countries with really effective economies instituted reforms that have allowed them to maintain growth of at least 7% per year for 25 years. The Sunday programme was on looking to the future and implementing those solutions. Lucy Symons and Emanuel Gavert of AIESEC International described how this student organization builds leadership and encourages an entrepreneurial spirit to create civil society-business-government partnerships, and directs talent to common interest issues. The AIESEC-EBBF partnership has led to activities in many countries on topics such as moral leadership and sustainability. AIESEC alumni are a gift to the world. The CEO of the Global Reporting Initiative (www.globalreporting.org), Ernst Ligteringen of the Netherlands, described their efforts to make sustainability reporting for companies visible, to connect value and values. This world is going to change from its present unsustainable path, requiring new values, attitudes and choices. Such massive adaptive change requires a different reporting system with real-time accounts about sustainability impact providing transparency, accountability and stakeholder dialogue. Sustainability positions companies for the future. The GRI guidelines include 10 principles and 79 environmental, social and economic indicators as a yardstick for reporting, plus sector supplements. This voluntary initiative is being applied by 3000 companies in the 22 OECD countries, and is a good start in an adaptive change process. It is an open community inviting participation, and is still incomplete, talking openly about difficult issues. The final keynote by Prof. Victoria Thoresen of Norway, Associate Professor, Hedmark College, and Coordinator of the Consumer Citizenship Network in Europe, discussed commitments that lead to change. It is important to engage the media and education, since many kids today have given up. To achieve prosperity, we know that we need to redefine human relationships, reorganize human affairs, radically reorder our priorities, reshape our institutions, increase access to knowledge, extend human abilities, and adopt consultation as an organizing principle. How to consult in business is still an unanswered question. Governance needs to have foresight, with long-term mutually reinforcing policies, institutional adaptability and flexibility, delegating more to the grassroots, and with majority rule respecting minorities. The market needs revised goals, and to be more long term and transparent. Civil society organizations have an important role in communications, envisioning alternatives and their consequences in collaboration with research and education, as a supplement to political involvement. Education and research need to explore processes and systems that provide foresight and test alternative scenarios, looking at flows of knowledge and social involvement, innovation and a new work ethic, teaching controversial issues. The individual needs vision, awareness, reflection and a global civic spirit. Personal indicators are needed of a responsible lifestyle. Arthur Dahl then provided a visionary closing summary of the high points of the conference. In joining together, EBBF and IEF had enriched each other, united by the importance of values to their work. In asking the question: Growth or Sustainability? we moved from conflict to vision, going from the big picture to microenterprises. We defined a new concept of prosperity, not tinsel and glitter, but a deep love for all humankind. For measuring change, we brought together many perspectives and creative new thinking, looking for indicators to leverage change. What can we do to achieve prosperity? Do we stand by as the old order is rolled up, or work for an evolutionary transition, building on what we already have? How much we save, and the smoothness of the transition, depends on us. Each of our small organizations has a catalytic role to play, EBBF with business and IEF with the scientific and environmental communities. We live in difficult times, with an increasingly unstable planet and society, requiring adaptive management. But we have seen the process here: the old sharing their experience with the young; the young giving energy to the old; partnerships magnifying our impact. We can leave here with hope and determination, keeping our vision and direction for the great efforts ahead. Go to the detailed conference programme for links to video clips and presentations. Thirty-nine e-participants who were not able to attend the conference in the Netherlands in person viewed the talks on-line at http://www.youtube.com/EBBFvideo, received rapid reports on each session by Karim Beers, and participated using a web-blog facilitated again by Judith Golova.